So begins Tsi Tsi Dangarembga’s semi-autobiographical novel Nervous Conditions, the story of Tambudzai, a teenage girl in (the former Rhodesia now Zimbabwe) who lives in two worlds: that of her parents, poor farmers who earn a meager living, and that of her aunt and uncle, whom the British colonists have chosen to receive an education in England and eventually to run the missionary school. I fell in love with Tambu in the first few pages, and as I introduce her to more readers, I have discovered that they take her to their hearts as well. This includes participants in a Books@Work group, women who are thirty to sixty-five, and college students in a “Questions of Identity” seminar. Until I requested it, the Cleveland libraries did not even own a copy of Nervous Conditions, but I consider Nervous Conditions a classic deserving of a wider readership. When I mention the title, people often think that I am referring to a book on psychology. However, the title comes from a quote by Franz Fanon, a psychiatrist, writer, and revolutionary who declared in his seminal work The Wretched of the Earth (1961) that “the condition of the native is a nervous condition.” Dangrembga’s semi-autobiographical novel suggests that like the natives living in what was called Rhodesia until 1980,Tambu also struggles against her condition, not only as a native, but as a girl living in a patriarchal society. 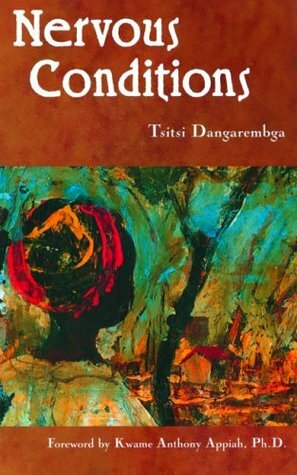 The plot is complex, but fairly easy to follow as Tambu sets out to explain, in the opening chapters of the book, why she is not sorry her brother has died. (No spoiler alert here, as it is best to let Tambu explain herself.) We meet other members of her family, including Jeremiah, her lazy, demanding father; Mainini, her mostly submissive mother; her Uncle Babamukuru, who heads the family and the mission school; Maiguru, Babamukuru’s college-educated wife who continues to kowtow to her husband’s many needs; and Nyasha, Tambu’s troubled female cousin, who plays a major role in introducing Tambu to a new world. The Books@Work group related easily to Tambu’s brave response as she comes to understand the patriarchy of her family, members of the Shona group. Many readers recognized themselves in Tambu’s spirited rebellion and determination to become an educated, independent woman. Several readers recounted their own teenage adventures, as well as those of their teenage daughters. We laughed often when sharing stories of sneaking out to see a boy or taking that first sip of beer. In more serious discussions, we listened to a participant who grew up in Nigeria and another married to a man from Zimbabwe. Both provided insights into customs and issues that frame Tambu and her family. These women’s experiences added richness to discussions fueled by Tambu’s resourcefulness and tenacity. My college students, much closer to Tambu’s age, were often outraged — particularly at the patriarchy and the colonialism. When Babamukuru and his family return from England to Rhodesia, their acquaintances treat them differently. They have become, as Nyasha says, “hybrids.” At her uncle’s house Tambu is shocked when Anna, a woman working for the Babamukurus, kneels down in front of the two girls to tell them that dinner is ready. Nyasha tells Anna to get up, but “Anna continue[s] her message on her knees.” These scenes shocked some students, most of whom have never seen the stark discrimination and race separations confronting Tambu and her cousin. Maybe it is especially that “fairness” that wins over readers. Tambu tells her story without pronouncing judgements or offering solutions. She reports that she has gone through a “process whose events stretched over many years and would fill another volume, but the story I have told here, is my own story, the story of four women whom I loved, and our men, this story is how it all began.” Dangarembga wrote another novel, a sequel to Nervous Conditions called The Book of Not. Next up: my book club will discuss Nervous Conditions. We have just read two novels by African authors, Disgrace, by J.M. Coetzee, and Americanah, by Chimamanda Ngozi Adichie, who won an Annisfield Wolf award for Half the Yellow Sun in 2007. These novels are as different from one another as one can imagine. I am keen to hear yet another group’s response to Nervous Conditions, and I hope that my friends, like me, will open their hearts to Tambu, just as the other groups have. But that is a tale for another time. Gail Arnoff received her B.A. from Western Reserve University and her M.A. from John Carroll University, where she currently teaches in the English Department. She also facilitates a seminar, “Questions of Identity,” in the SAGES program at Case Western Reserve University. Tagged: book review, Books@Work, Chimamanda Ngozi Adichie, review, Tsitsi Dangarembga.